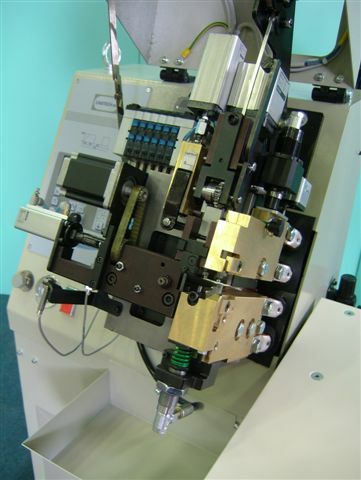 The ESS6 heat crimping machine was studied to connect enamelled wires and cables, normally used in the electromechanical industry. The ESS6 heat crimping machine, as well as having a high speed semiautomatic cycle, also gives reliability and repetitiveness in the heat crimping process. The ESS6 heat crimping arose as a development of the previous ESS4 and ESSS versions after the electronic and mechanical aspect were revised, with particular attention given to reliability and ergonomics. 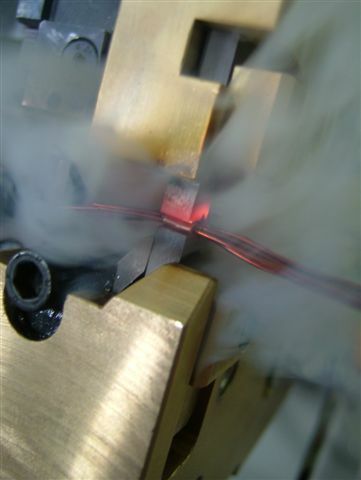 As a connecting support the heat crimping uses a small copper plate covered by tin or silver and produced in different sections, 0.Sx4 - O.SxS - 0.8x6. The machine goes through an initial clip construction phase, positioning the clip between the electrodes. Once the wires and cables have been introduced they are pressed and welded. The welding process removes the enamel from the wires and compacts the whole unit into a single body with high mechanical and electrical characteristics. A knife can be activated when welding is finished to cut the excess part of the wires and cable. The wires are closed by a mixed air-oil system at forces that can reach up to SOO kg. In general temperatures of up to 600·C can be reached, and the nominal power used is S kW. The machine has a cooling circuit that runs along the electrode holders and all the parts that are subject to heating; a refrigerator is normally supplied for this purpose. automatically. The machine has a socket carrying group for forming the crimp. This group, as well as being fast change (total replacement in less than S minutes), also has a stepper motor with encoder to regulate clip rotation. The electronic system can save up to 99 programs with different power values, active and passive time, ramp time and number of repetitions. Each program can determine the rotating angle of the crimp and the plate length. A bar code reader can be connected to the machine, and a back up key with flash technology has been developed, allowing the user to save all the welding data.